Tradition is a concept that is completely foreign to my family, which is totally frustrating to me in every way. The closest thing to a tradition I had in my childhood was having the same cake for my birthday since I was thirteen. Rory Gilmore sets out mallomars spelling out “happy birthday” for her mom every year. What the heck, that’s way better. Growing up I was always so jealous of my friends who had actual holiday traditions with real families (note: my family is real but small compared to most other suburbanite clans, and definitely very distant even when we lived in the same house) Although I was jealous of my friends’ traditions, the one thing I really wished for was to live somewhere that thrived on traditions just as much as I wished I did. That place obviously isn’t anywhere real that I know of, but the closest thing was binging on Gilmore Girls and dreaming of living in the very quaint Stars Hollow. First of all, why can’t I have breakfast in a diner every morning? Probably because I don’t drink coffee or wake up at the same time every day. Regardless, I want a dad-type figure who makes me waffles for free, like hey here’s some dadly advice w/ an extra side of carbs – don’t worry, you’re a Gilmore girl so you don’t need to worry about counting calories. Mainly I just want to run into people daily that I want to see, whenever I run into people it’s like, a boss that laid you off because the company spent all of the investor money or a boy you had two dates with after pretending to like a tv show he listed on OkCupid. And can we just talk about the AESTHETICS in general! Stars Hollow is so quaint it makes me want to die and then resurrect myself to plant a billion trees everywhere. There should be some sort of zoning law where every town must have a town square, gazebo and all. All the way up until the summer between 6th and 7th grade, I dreamed of having my first kiss in a gazebo only to be let down by kissing someone by some dead plants across the street from a laundromat. Wait, going back to breakfast carbs, my boyfriend is from a teeny town in Iowa and we went there to visit his parents and they had a PANCAKE FESTIVAL. Are you kidding me, how perfectly Stars Hollow is that. Why can’t I live in a teeny baby town with ridic festies all of the time that the whole town gets super into? 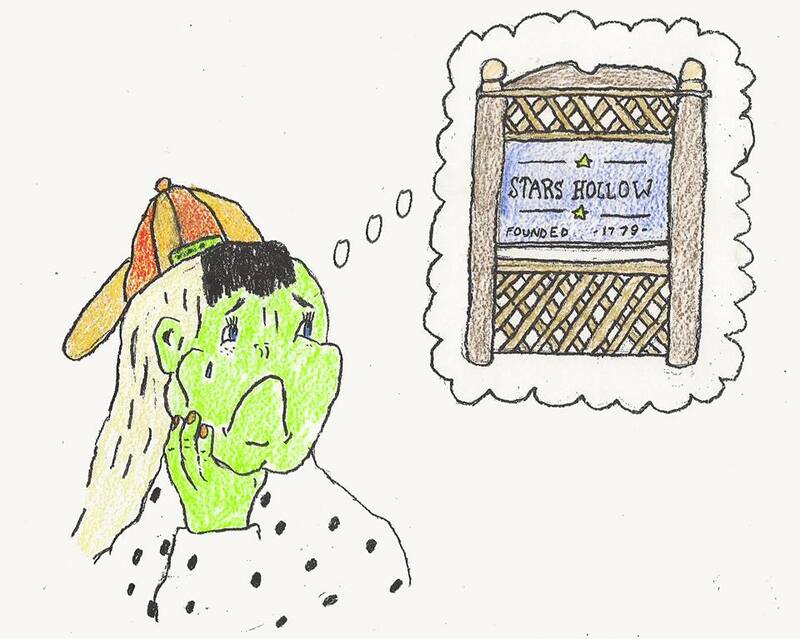 Stars Hollow has a billion and I am SO JEALOUS. The living art one, holy crap. Who thinks up that kind of thing. The fact nearly everyone participates and does so annually. Now I’m from a small town, and there is a town festival, but it’s not as quirky as that, mainly it’s just someone’s dad in a band playing dorky songs and a giant sandcastle (which they stopped doing a few years ago so what even is the point anymore!) I just want to live in a town where I can put homemade jam in a picnic basket and have some dreamboat pay money for it so we can kiss on a bridge. Where’s that kind of romance in the city? Seriously! !